We doubt we're the only ones planning to kick off the summer with a trip to a national park. Even if this wasn’t the centennial year for the U.S. Park Service, millions of Americans could be expected to hit the road with their families and friends to see and enjoy some of our collectively held and cherished landscape. But while we share everyone else's love for the national park system, we dislike dealing with everyone else in the same places. So we’ve assembled a list of seven of the best U.S. parks to visit in June, with tips on how to find beauty and solitude in each. June can deliver unbearably high temperatures, unfortunately. So we’ve deliberately left off the list popular parks such Joshua Tree and Death Valley in California, although surely there are fans of consecutive 100-plus-degree days. For those who prefer less scorching environments, here are our top picks. As popular as Yosemite National Park is—attracting some 3.3 million people annually and 14,000 on any given summer’s day—it’s easy to escape the throngs and take in the majestic snow-capped peaks in isolation. Ninety percent of park visitors pack themselves into the mall that is Yosemite Village in the southern third of the park. That leaves most of the 800 miles of marked trails through California’s High Sierras to explore in relative peace. The campgrounds are typically full July through August, so make sure to find lodging in advance. This is essential, as the full breadth of Yosemite can’t be adequately experienced in a single day. Certainly take a shuttle bus to the Valley Visitor Center in the village to get your bearings, but don’t waste much time in the shops. Allow yourself to lured away by the promise of blooming lupine, redbud, and Mariposa lilies. The crowds correspond with the peak flow over the park’s awesome waterfalls in May and June. So pick a week day to experience the melting snowpack at higher elevations thunder down Yosemite Falls, the highest in North America and second highest in the world at 2,425 feet. The Lower Yosemite Fall is easiest to get to, but a challenging 3.6-mile hike is required to get to the Upper Yosemite Fall and spectacular views of the valley. 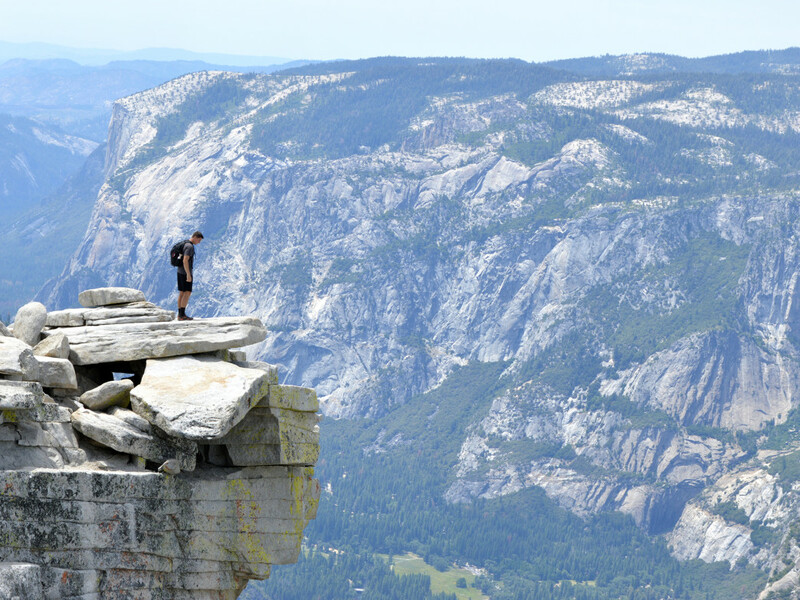 That trip alone may leave little time to also take in the Tunnel View Overlook, where the vista includes several oft-photographed peaks such as Half Dome and El Capitan. The latter alone can take days to climb and require sleeping in slings hung from its cliff faces. While it can be downright hot in the valley in June, the snow still may not have receded to allow the opening of Glacier Point and Tioga roads into a magical alpine world with few people go. Hiking cables to Half Dome are typically in place by late May, although lingering snow may hamper the ascent so early in the climbing season. Keep in mind, crossing streams when the water is high is dangerous, too. If you’re determined to backpack this time of year, consider the Hetch Hetchy area along the Toullumne River in the northwest. 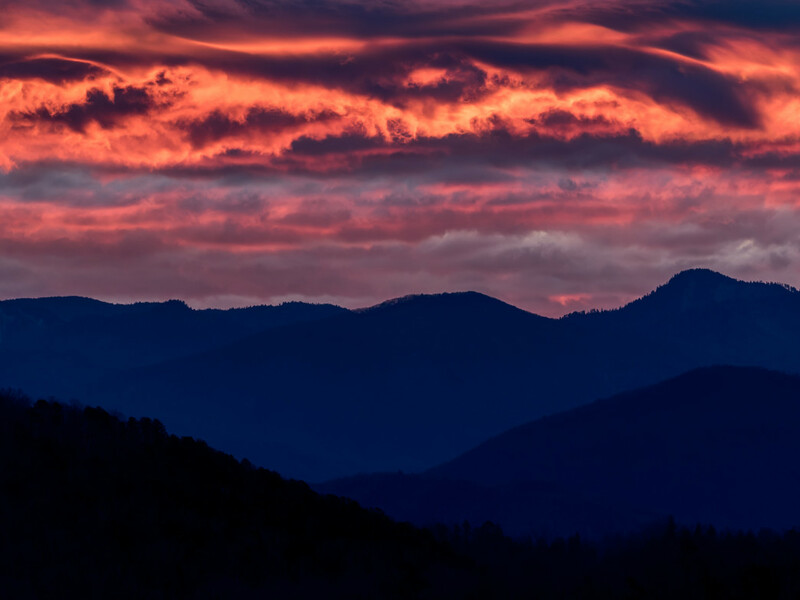 There’s no denying that the Great Smoky Mountains, in western NC and eastern TN, is the busiest national park in the U.S. With some 9 million visitors a year, the Smokies attract twice the number than any other. Few of the 60,000 people who enter the 800-square-miles of mountainous and forested park on a summer weekend day ever leave their cars or the Newfound Gap Road that links the visitor centers of Sugarlands, near Gatlinburg, TN, and Oconaluftee, near Cherokee, NC. All that car exhaust affects visibility, not to mention the overall health of this international biosphere reserve. But the concentrated visitation happily leaves uncongested most of the 880 miles of hiking trails. That means in June you can luxuriate in the rhododendron, mountain laurel and wild flame azalea bringing vibrant colors to otherwise unbroken expanses of deciduous old growth forest. If you only have a day for the park, plan to reach the top of lookout tower at the top of Clingmans Dome, the highest point, by sunrise. The payoff is a 360-degree view from the heart of the Smokies. Then head to the western edge of the park and bike the 11-mile Cades Cove Loop Road, which is closed to motor vehicle traffic from May to late September, and spend a couple seconds feeling sorry for all the poor car-bound people a few peaks away. Stay longer to climb Mont LeConte—which, at 6,593 feet, is the park’s third highest peak. The shortest and steepest way to the top is via the Alum Cave Trail. Make sure to keep a tight grip on the cable that crosses a sheer cliff face at one point. From there you can also tackle the Chimney Tops Trail, another doozy with 1,300 feet of climbing over just two miles. On a day of hiking like this, you’ll pass through Arch Rock en route to the treeless but wildflower covered Inspiration Point. 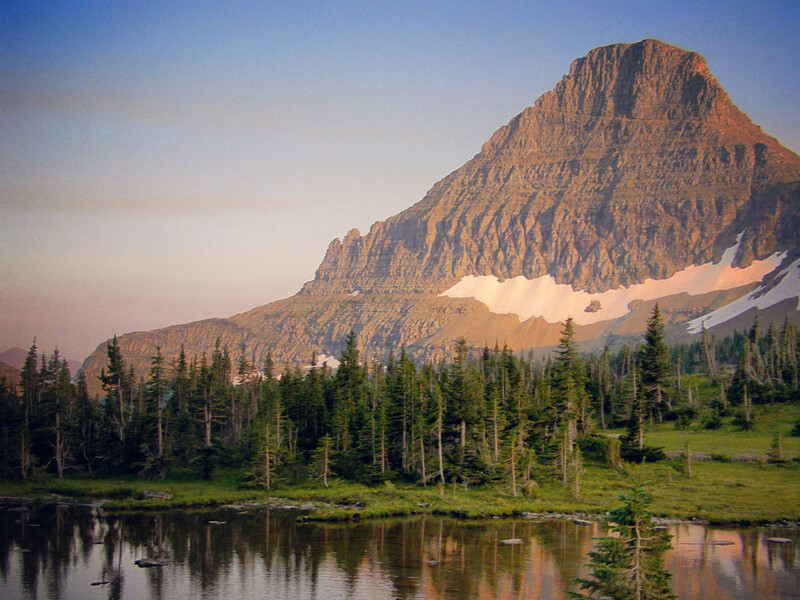 Another national park primarily experienced by visitors from inside their cars on a spectacularly scenic highway is Montana’s Glacier National Park. But again, to get up close and personal with any of the mountains, glaciers, waterfalls, or 650-plus lakes within the park, one needs to leave their vehicle behind and hoof it on the 700 miles of hiking trails. The Continental Divide splits Glacier from north to south. The forested trails to the west start at an elevation of 3,200 feet and are less traveled. The eastern trails, at 5,000 feet, attract crowds because of the wide-open vistas. The exact timing of your visit will be key if you hope to find particular trails open, however. Park service personnel advise that trails at lower elevations and at the edges of the park tend to be free of snow well before the trails in the center of the park and near the Continental Divide. Some trails higher up stay snow covered until late July. It’s best to call ahead to find out if the main highway, the Going-to-the-Sun Road, is open by late spring. While plowing the road can take up to three months, all 50 miles of it is usually open by mid-June and impassable again in mid-September. The Apgar Campground on the west side and the St. Mary Campground to the east are open year round, but there is no running water or flush toilets at either much of the year. The water isn’t turned on at Apgar until early May. Car camping sites tend not to open for the summer before July 1. Because the persistent snow makes spring camping and hiking so challenging, the park requires overnight visitors to obtain backcountry camping permits and fill out itinerary forms in the event that they are reported missing and a search and rescue effort is required. The park is home to grizzly bears, elk, and bighorn sheep. With luck you’ll avoid the former and catch glimpses of the latter two. You should be spared having to deal with mosquitoes and biting flies, as they tend not to be a nuisance outside July and August. 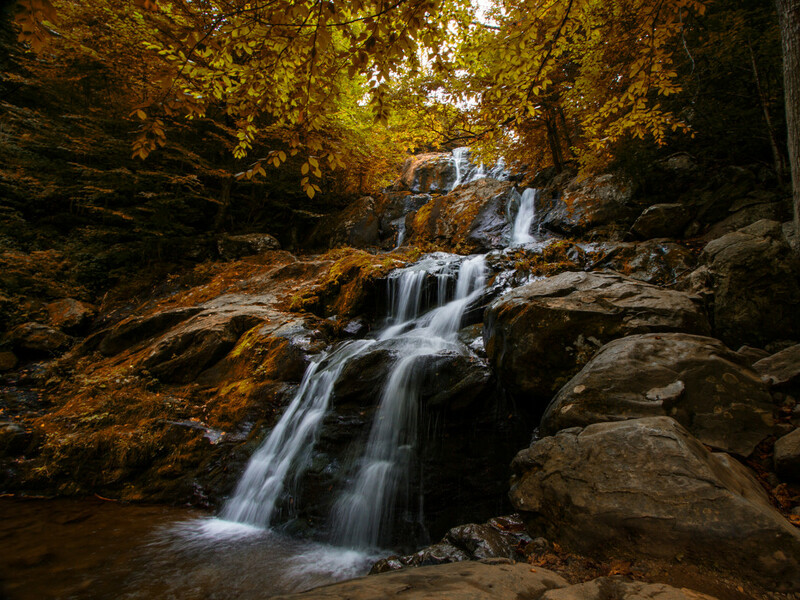 Shenandoah National Park is a long, narrow strip of the Blue Ridge Mountains in Virginia. The crest can be driven or hiked for 100 miles, as Skyline Drive runs parallel to the Appalachian Trail. A few more hundred miles of hiking and horse trails can be followed to even better appreciate the Shenandoah Valley. The most popular—and dangerous—hike is to the top of Old Rag Mountain. No view is worth significant injury, the park website suggests, so hikers are urged to take precautions: give yourself at least seven hours to complete the nine-mile circuit, carry at least two quarts of water, but otherwise pack light for the rocky scramble. It’s a difficult climb, yet many people do it, especially on weekends, resulting in long waits at the approaches to the most narrow passages. Go early on a week day to ensure you find a parking spot near the trail head. Campsites are limited. If you go, make sure to thank in advance any search and rescue personnel and Old Rag Mountain Stewards you encounter. You may need them later. The park service suggests other hikes of varying difficulty, too. Pull off of Skyline at any of the several overlooks and consider yourself lucky to be enjoying the magnificent views so clearly. As summer wears on, a haze settles over the horizon—caused by the interaction of dust, organic matter and water vapor—giving the Blue Ride its namesake blue. The romance of that natural phenomenon dulls, though, as the blue darkens with the accumulation of industrial smog and vehicle exhaust adding to the mix. Even in June, the Shenandoah mountaintop can be 10 to 15 degrees cooler than in the towns below. And while the days are warm, you’ll want to put on an extra layer or two at night. 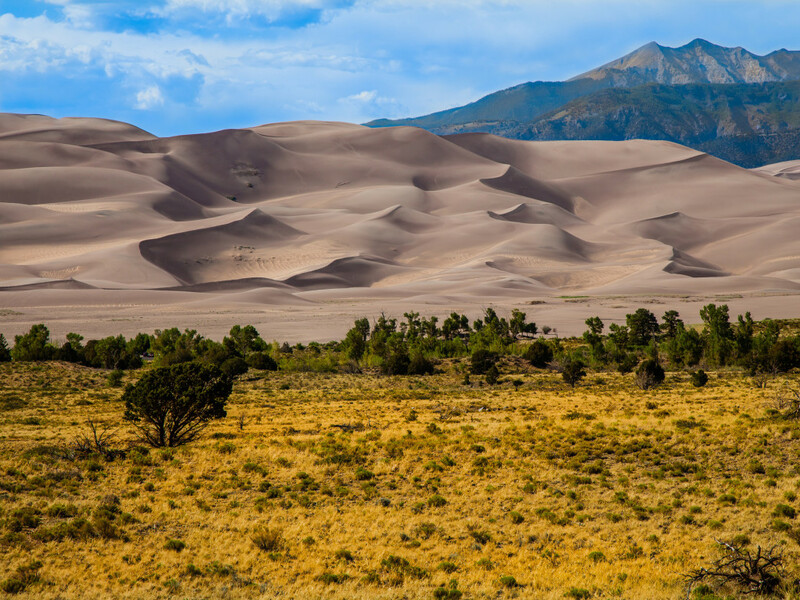 The Great Sand Dunes are constantly shifting over 30 square miles between the San Juan Mountains and the Sangre de Cristos in southern Colorado. Forty mile per hour winds can pile the sand as high as 750 feet. Medano Creek, which meanders along the edge of the dunes, helps sustain the moisture content in the sand that makes this place so unique. As tempting as it might be, the Great Sand Dunes are not where you want to be without shoes—or sunscreen or water. The temperature of the sand can reach 150 degrees on sunny summer afternoons. Despite that fact, that’s when the park is most crowded. The dunes are best hiked in the either early or late in the day. That when the photos are best taken, too, as the sun casts dramatic shadows across the undulating sand. Moonlit hikes are eerie but peaceful. But bundle up before you go, as it get down into the 40s. If you want to hike during the day, when the air temp is 75 to 80 degrees on average in June, you can head up into the foothills of the Sange de Cristos. The minimal shade of juniper and pinyon pine makes way for aspen and cottonwood, and further still, spruce and fir trees. It’s an alpine tundra landscape on the summits, so the groundcover is never lush. Nevertheless, there are a couple short trails that can lead you into mule deer and coyote country. What life does thrive here does so above and beyond the dunes. That means there’s no need to worry about stepping on scorpions or snakes in the sand itself. Ranger-led walks and programs are only available in the summer. Check at the visitor center for a schedule of activities. Local tourism officials like to point out that visitors to Isle Royale in northern Lake Superior stay an average of 3.5 days, while the average visit to other national parks is just four hours. That makes sense when you realize it takes several hours to get there by ferry, which make only so many trips, from the mainland of Minnesota or Michigan. The fact remains, fewer people visit the 45-mile-long island in a year than go to Yellowstone every day. It’s as fascinating a place as it is remote. Isle Royale is perhaps better known for the interplay between its wolf and moose populations; the focus of study by animal researchers since the late 1950s. 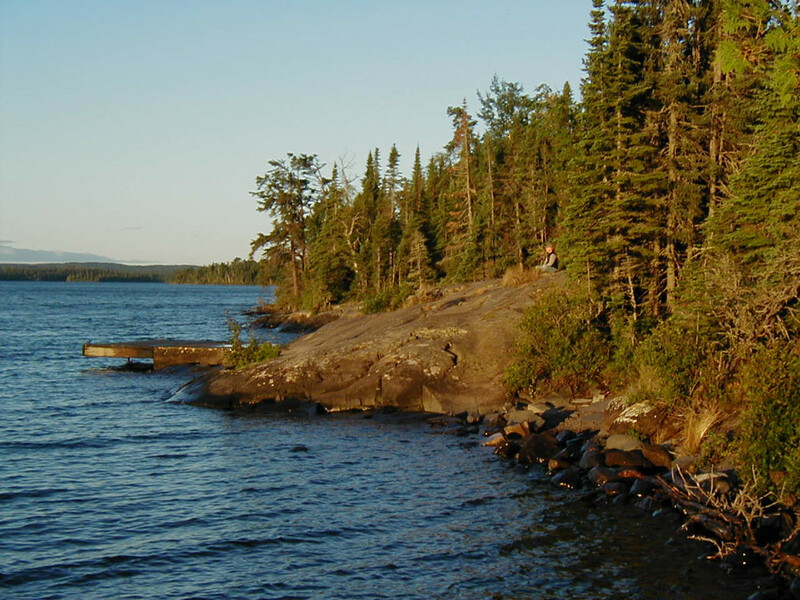 The United Nations designated Isle Royale an International Biosphere Reserve in 1980. When you’ve had your fill of hiking and kayaking, you can scuba dive to one of the many shipwrecks around the perimeter of the island. Isle Royale is worth the trouble to get to, but the place is not for the meek. June and July is a good time to go for many reasons, but it’s also when the mosquitoes, black flies, and gnats swarm and bite most annoyingly. “If you can’t stand bugs, you will want to arrive mid-August to early September. If you are crazy about wildflowers, mid-June to early July is the best time. Fisherman prefer June, and many backpackers arrive mid- to late September to catch the fall colors or rutting season of the moose,” writes Jim DuFresne in his guidebook Isle Royale National Park Foot Trails and Water Routes. No matter the time of year, the water there must be boiled for at least two minutes to kill tapeworm cysts. And while the Isle Royale is closed to visitors November to mid-April, campsites can’t be reserved when it is open, so cross-country trekkers just have to hope they can find an unoccupied one by nightfall. Lake Superior has a cooling effect on the island, generally keeping the day-time temps from exceeding 70 degrees before mid-August. The nights can be in the 40s, though. Thunderstorms and fog are common in the spring and early summer, so it's recommended to have a weather radio handy and tuned in to NOAA broadcasts out of Houghton, MI, or Thunder Bay, ON. A less remote and arguably even more scenic alternative on Lake Superior is the Apostle Islands National Lakeshore off the tip of Wisconsin’s Bayfield Peninsula. Voyageurs National Park along the Minnesota-Canadian border is dwarfed by and less well known among Midwest canoe-campers than the Boundary Waters Canoe Area Wilderness in northern Minnesota or Quetico Provincial Park in Ontario, Canada. Nevertheless, Voyageurs offers a similar landscape with its 300 islands on 30 lakes—the four largest of which are Rainy, Kabetogama, Namakan and Sand Point—all linked by narrow waterways and portage paths. 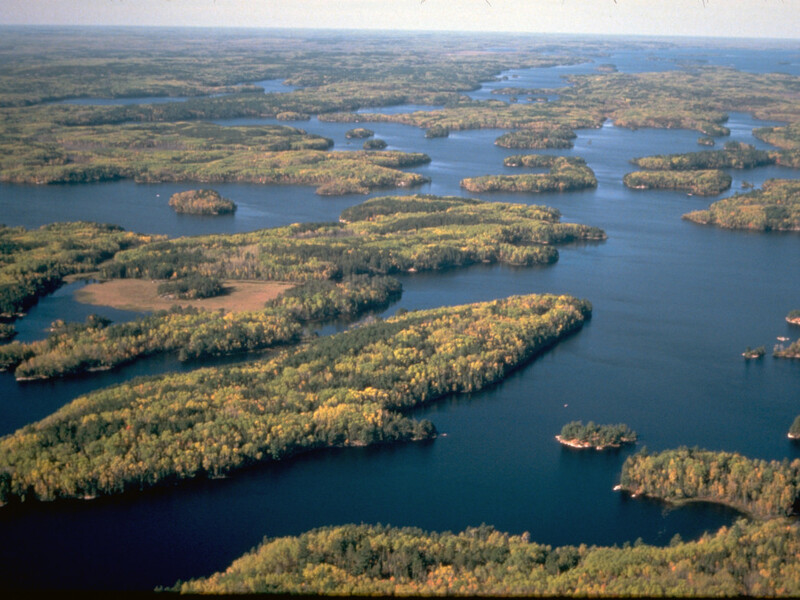 A key difference is that motorboats can access the 55-mile long park, whereas the adjacent Boundary Waters can only by plied by kayaks and canoes. The distinction means little to the loons, nesting bald eagles, moose, and wolves that find sanctuary throughout the region, or the walleye, northerns, and smallmouth bass that are sought by countless anglers. All that water is a breeding ground for bugs, too. Mosquitoes and black flies are the worst there in early summer. Except in the winter when ice roads open up, the national park is only accessible by water. Canoes, kayaks, houseboats, motorboats and guides are available for hire in the several small resort towns just outside the park. There are three short hiking trails near the Ash River Visitor Center, where you can also inquire about boat tours with park naturalists.